- Help about callto URLs, which are a new feature of GnomeMeeting 0.93 released next week. Happy birthday GnomeMeeting and Jonita! Today it is the birthday of GnomeMeeting (the first one) and of my girlfriend, Jonita! I'm happy to inform you that GnomeMeeting won the OpenSound "Killer app of the month" award. Thanks to them and thanks to Dev Mazumar, the president of 4Front Technologies, for this quote: "I must say that GnomeMeeting is a very professional product and I wish you all the best." You can visit OpenSound's homepage at http://www.opensound.com. Argo has been having problems since a few weeks. A new ILS directory has been setup. This last one is now on a powerful computer with high-bandwidth and a static IP. Please do not use anymore argo.dyndns.org or gm.uk.linux.org. We are providing this service for free, so please, if you browse the ILS directory, register to it (Preferences->Directory->Enable Registering). You can now use the new ILS directory ils.seconix.com. Sander and Santiago have prepared the GnomeMeeting and OpenH323 debs. The GnomeMeeting deb package will not be included officially in Debian before Gnome 2 has been released. You can download them in the download section. Debian has all the needed Gnome 2 packages to be able to install the deb. Tomorrow, it is the birthday of Kenneth. Kenneth is a long time contributor to GnomeMeeting and he recently added smilies support to the text chat. Happy Birthday Kenneth! GnomeMeeting 0.92.1 is available in the download section. Only sources are available till now, but binary packages will be available soon for distributions providing GNOME 2.0 binary packages. After only 2 months since the last release which is now included in standard in all Linux distributions, a new release is ready. I'm now waiting for the translations to be ready too (don't hesitate to help). This version is a port of GnomeMeeting 0.85 to Gnome 2 and GTK 2, but it also includes a lot of code rewrite, and some interesting new features. The source snapshots are now "Gnome2 ready". The code has been ported to GTK2/Gnome2, it has been cleaned and improved. You can now consider that GnomeMeeting is fully ported. The snapshots also offer a new configuration druid that will help you to configure GnomeMeeting following your connection type (among others) the first time that you run it. If you are a windows developer, please contact me. The windows port of GnomeMeeting is in good way, but help would be appreciated. I'm not doing the port myself, but somebody is working on it since a few months. I added a new subsection in the downloads part of the website called "Sources Snapshots". 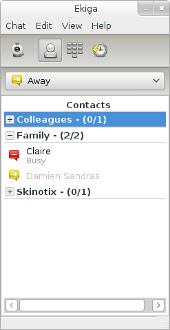 Those snapshots are CVS snapshots of our daily work and they are good opportunity for people only having anonymous access to the Gnome CVS to download the bleeding-edge sources of GnomeMeeting. Current sources need Gnome 2 to compile. Those snapshots are auto-generated each night at 1am GMT+2. Enjoy! Rafael has released a new version of the FAQ. The new FAQ is available at the usual place. Don't hesitate to send him contributions, or suggestions.